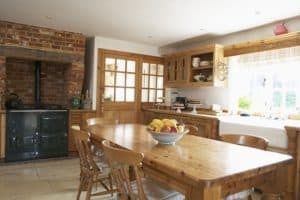 Choosing the best finish for your wooden kitchen table is an important decision. After all, you probably use the table every day, which means that the finish needs to be durable. What’s more, since the table comes into contact with food — especially if you have little ones — it needs to be safe for a kitchen when it cures. Whether you’re refinishing an antique kitchen table or transforming a thrift-store find, the right finish makes a big difference. 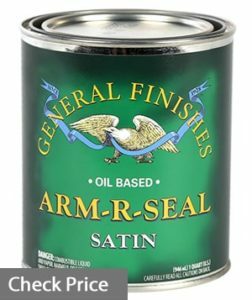 Arm-R-Seal Oil Based Topcoat is a tough, long-lasting wood finish that comes in a can with a pry-off lid. You can buy it in a variety of sizes, which can help reduce waste if you’re refinishing a very small or very large kitchen table. This finish is made with urethane resin, which means that it’s extremely durable. If you apply it according to the directions, it can last for many years before it needs to be reapplied. For a kitchen table, this might be ideal. Once it’s dry, it tolerates cleaning with Clorox wipes, so you can disinfect your table easily. You can apply Arm-R-Seal with a cloth or a foam brush. It’s relatively easy to remove the drips, though you need to do it right away to prevent drying. It’s also a good idea to apply this product in a well-ventilated area. Since this Arm-R-Seal product is oil-based, it has a few drawbacks. It tends to dry in a rich amber color — it looks nice, but if you’re not expecting it, or if it doesn’t go with your final look, it can be an issue. The oil content also means that the finish takes a long time to cure. In fact, the company recommends that you don’t clean the table for 30 days after you apply the last coat. Overall, this oil-based finish is recommended for more advanced woodworkers. 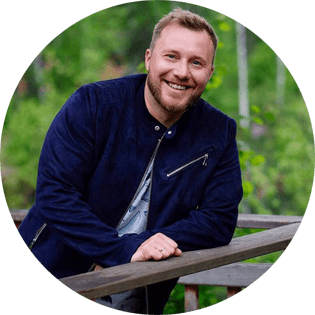 It might take a bit of time to get the hang of the application process, but once you do, the end result looks near-professional. Does your kitchen table see a lot of activity? 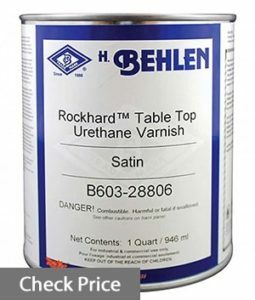 If so, this Behlen Rockhard product could be the right choice. The formula dries hard, so it can help resist scratches and nicks. The best thing about this Behlen finish is its durability. Once it’s cured, the finish prevents abrasions; it also resists water and detergents, which is helpful if your kitchen table doubles as a homework station or play area. After you’re finished applying this finish, it needs at least 48 hours to dry completely, assuming the temperature in your workshop is at least 72 degrees. If you live in a cold or damp area, you can expect the drying time to be longer. The long dry time of this option can be an issue if you’re planning to apply multiple coats. In fact, you need to wait at least 14 hours between coats. While this isn’t a deal-breaker, it’s important to work the timeline into your planning. Overall, I recommend this product, but only if you have a well-ventilated shop and plenty of time for drying. However, if you have the patience, you can achieve a long-lasting finish. If your kitchen table has a great deal of detail, this Waterlox finish can show it off. The finish has a gentle, pleasing gloss that highlights carvings and beautiful joinery, but it’s not so glossy that it shows fingerprints. 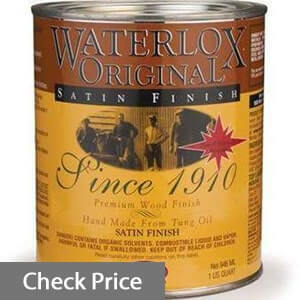 Waterlox Original is made from tung oil. The oil penetrates the surface of your wood, creating a water-resistant finish. That means that it stands up well to spilled milk, heavy use, and other liquids. If your kitchen table gets a medium level of activity, this could be a good option. It’s also relatively easy to maintain. Keep in mind that this Waterlox option can’t be used alone — you’ll also need to apply the Waterlox sealer, or a sealer from another brand. Waterlox is recommended for your kitchen table if you want a gentle gloss. It stands up to low-use and medium-use households nicely. Minwax Fast Drying Finish can be used on both finished and unfinished wood, making it a convenient option when you’re not sure if you’ll apply a primary finish. It can be applied with a natural bristle brush, a lambswool applicator, or a foam brush. One of the big benefits of Minwax Wipe-On Poly is its drying time. As long as you apply thin coats, the finish dries quickly. This is an advantage if you’re working in a dusty workshop or an outdoor area — the faster your finish dries, the less likely it is that dirt, dust, or debris will get trapped in it. Each thin layer takes just a couple of hours to dry completely. Then, you can use sandpaper to scuff it gently and apply the next coat. This product is extremely forgiving, so it’s easy to achieve a beautiful end result. It’s important to note that although this Minwax finish is clear, it’s probably going to change the color of your wooden table slightly. This is because of the oil in the product. The color change is small but visible. If you like a warmer look to your wood, this could be a great choice for you. The drawback to this Minwax finish is the number of coats you need. Minwax recommends two or three coats. However, since your kitchen table is a heavy-use piece of furniture, you’ll probably actually need four or five coats for durability. Between applying, sanding, and drying, that means that the refinishing process is going to take a considerable amount of time. 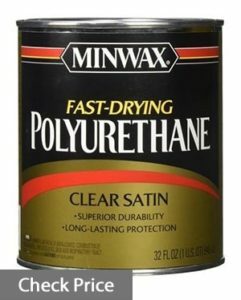 If you have the patience, however, this Minwax product creates a beautiful finished result. We recommend it for more advanced woodworkers. 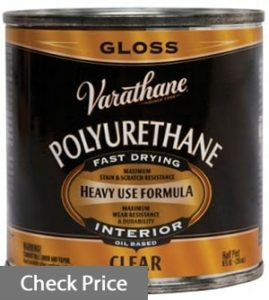 If you’re looking to finish a kitchen table that gets regular use, this Rust-Oleum product can be a great choice. It’s designed specifically for heavy-use areas, so it’s extra durable. If your kitchen table has a beautiful wood grain, this finish is one way to highlight it; it’s designed to allow the grain to show through. The warm tone of the finish shows off the intricacies of each piece of wood in your table. As you’re using this, be prepared — it has an extremely strong smell. This is completely normal, but it’s a good idea to work in a well-ventilated area. The finish dries very quickly, so it’s a good idea to wipe up any drips immediately. Although this product is billed as clear, it actually adds a golden glow to the wood. I recommend this Rust-Oleum finish, particularly if you’re finishing a table with a prominent grain. It’s not recommended for use over paint because of the tendency to yellow upon drying. Finishing your wooden kitchen table takes time and effort. When you choose the right option for your skills and lifestyle, you can get the job done right on the first try. As you look at different options, here are some factors that can influence your decision. As you’re looking at different types of finishes, application matters. Are you new to wood finishing? If so, you might want to go for a finish that wipes on — that way, you don’t need to worry about making mistakes. If you’re a more advanced woodworker, you can opt for spray-on finishes or brush-on finishes. Both of those options require more skill, so they’re not ideal for beginners. If you prefer to spray-finish your wooden table, check the manufacturer’s instructions; not all wood finishes are compatible with a spray gun. Oil finishes add a bit of depth and color to unfinished wood. They also protect the wood, making them ideal for kitchen use. Varnish is a clear finish that dries extremely slowly, and may be difficult to apply. Usually, they’re best when paired with another finish, such as dye. This material is made from wax and solvents. It’s easy to apply, but it’s not durable enough for a heavy-use kitchen table. Since you’re refinishing a kitchen table that gets heavy daily use, durability matters. After all, you’re probably going to eat on the table every day, you’ll need to wipe it down every day. You might also drop your keys and bags on the table, use it to prepare food, or use it as an arts and crafts section. All of these activities take a toll on the finish — so, to get the most bang for your buck, it’s a good idea to pick the most durable finish. Varnish and oil-based poly finishes are the most durable. Tung oil and linseed oil are relatively durable. In general, it’s best to stay away from shellac. Lacquer can be tough, but it tends to take on a yellow color as time goes by. Many wood finishes are made with strong chemicals. This means that they have intense smells. If you’re working in an area with minimal ventilation, or if the weather won’t allow you to keep doors and windows open, it can affect your choice. In general, water-based finishes tend to be less potent; they might be the right choice when you have limited air circulation. Ventilation is especially important if you’re using a spray-on finish. When you’re refinishing a wood kitchen table, the finish you choose matters. By doing your research and choosing the product that’s right for your skill level and project, you can achieve a beautiful finish.